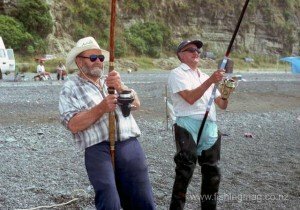 Home » Surfcasting » Surfcasting Tips for Beginners NZ – Tackle, baits, when, where & how to catch fish! Casting over the surf behind the old railway station at Kaikoura. 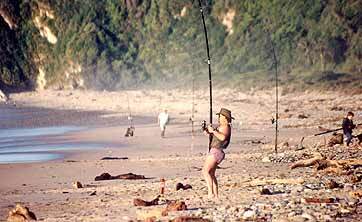 In Surfcasting Tips for Beginners New Zealand, we’ll cover what you need to get started catching fish from the beach. We’ll also give you some quick and easy tips on the tackle required, how to rig your gear, along with when, where and how to fish. Surfcasting is perhaps the most leisurely form of fishing there is. I often associate the sport of surfcasting with lazy summer days spent at the beach with the kids, especially over the Christmas holiday period. At such times we would pack up the car and head off for camping holidays at places like Mokihinui, Karamea, Ross and Hokitika, on the South Island’s West Coast. The car would always be “overloaded” with camping and fishing gear. So much so that on one trip the rear axle on the old Toyota decided it couldn’t take the strain any longer. As the old car groaned, it’s suspension floored, the axle gave out! This slowed the trip only slightly as we waited in Nelson for several hours for it to be fixed. For some reason, we always seem to take too much gear along. This is a very difficult habit to break! A good sized snapper caught during the Ninety Mile Beach Surfcasting Competition held each year during March up in Northland. Photograph, Denis Moresby. We would spend lazy days under the hot sun, interrupted only by the occasional glance up at the rod tip. This would be followed by a sudden frenzied winding of the handle when a fish would take the bait. Many readers will be unaware that at Karamea, for example, the vista of a white sandy beach, blue sky, and cobalt blue sea has more in common with a tropical island paradise than it does one’s usual vision of the wet and wild West Coast. It is a secret that is starting to get out, though, as the number of overseas tourist in hired campervans at these places in high summer has increased noticeably in recent years. 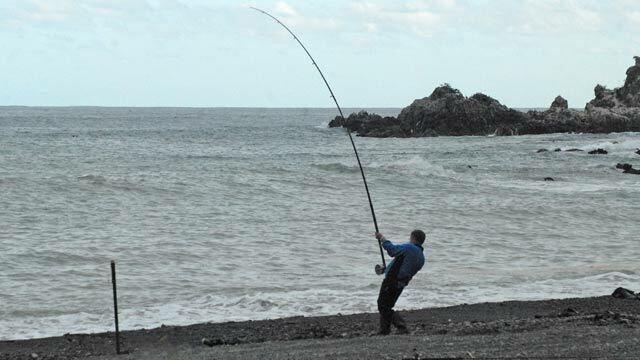 The West Coast is one of the best places in the South Island to catch an elusive snapper while surfcasting. There are always plenty of kahawai about too. I would also like to point out that over the winter months the West Coast beaches offer some of the best surf fishing to be had anywhere. Elephant fish, huge red cod, various sharks, and kahawai can be caught in the sort of numbers that will come as a big surprise to surfcasters more used to fishing Canterbury’s beaches on the other side of the alps. Getting together a group of surf anglers for a trip to Hokitika, or even Haast is a great idea at this time of year when the weather is inclined to be more settled. One of the best things about getting into surfcasting is that it need not be expensive. Nowadays surf rod and reel sets can be purchased at crazy prices that just a couple of years ago were unknown. New 12 foot rod and reel sets are now selling for under $100. Aside from the rod and reel, all you need is some monofilament fishing line a few sinkers, hooks, and some bait, and you are in business. These anglers Athol (left), and Don have a great deal of surfcasting experience between them. Their old fibreglass rods have taken plenty of fish while surfcasting. You don’t need expensive gear to catch fish! 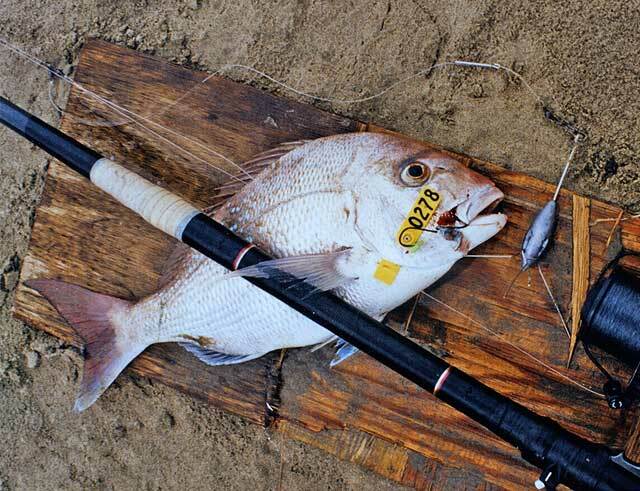 Here are a few tips aimed at those buying surfcasting gear for the first time. The most important thing of all is the rod. Casting Weight: In my view, you need to buy a rod that is designed to cast at least 100 gms, which is about four ounces. Anything less than that and you are wasting your time. With a reasonable surf and tide running, you need to be able to cast out a heavy sinker that will hold on the bottom. The heavier sinker and correspondingly stronger rod required to cast it will also prove invaluable when casting into any sort of headwind. Don’t forget that the bait will also add both weight and wind resistance when casting. If you have the option get a rod designed to cast between 150 to 200 gms, or in the old imperial measures that is 6 to 8 ounces. You can often find a good used surf rod in second-hand stores. Rod Length: You need a rod that is at least 12 foot (3.66 metres) in length. If you have a choice and can afford it, go for an even longer rod if possible. A 14 footer is ideal for surfcasting. Personally, I prefer a 15 or even 16-foot model when fishing the rough surf. Longer rod length is needed for casting any sort of distance. Although it is true that the longer the rod the greater the leverage advantage you are giving up to a fighting fish. The most important job your rod must perform is that of tossing your baited hooks and sinker out over the breakers. Most experienced surfcasters fish with several rods at the same time. I like to cast out baits on two surf rods and a then fish a spinner on a third rod for kahawai. Sometimes as a bonus a salmon or sea-run trout will take the ticer intended for kahawai. After fish with different rods at the beach, you will find you prefer some rods more than others. The author with a long surf rod. Note that most of the curve is in the top half of the rod. When the sea is very calm, particularly on a steeply shelving shingle beach, a long rod and heavy sinkers are not so important. Often, in such conditions, a long cast will work against you as you could well be casting over the heads of the fish that can be feeding in the stirred-up water right behind the first breaker. However, these calm conditions cannot always be expected. They will be the exception rather than the rule! It is easy to shorten the distance of your cast in calm conditions whereas a short sloppy rod will be useless when you need to cast a long distance. I first started surfcasting with an old Kilwell solid fibreglass rod. It was a 12 footer. I’ve rebound new guides on to it so many times I’ve lost count. From memory, I think it had a sticker saying which model it was but this has long since disappeared! I think it was a Beach Baron. By today’s standards, it is an ugly old thing but I sure caught some fish on that old rod, including half a dozen big sevengill sharks from the beach at Birdlings Flat, on the south side of Banks Peninsula. The biggest measured 8 foot 3 inches. That old rod had a very slow action. That is to say that under load it bent on an even curve along almost all of its length. Today I prefer a fast action surf rod. A fast action means that under load, either from casting or fighting a fish, most of the bend in the rod will take place in the upper third of its length. The bottom two-thirds of the blank will hardly bend at all. A powerful fast action rod is much better for distance casting. It will also have the power to spare when casting a slightly heavier sinker. It is worth noting that a good surf rod from a top line manufacturer, such as Kilwell Sports, will have its optimum casting weight written on the side of the rod blank, down near the handle. Usually, there will be a casting weight range displayed, such as 80-110g (3-4 ounces). I’d be immediately suspicious about buying any rod that didn’t display it’s “recommended casting weight” range in this way. Kilwell Sports is a New Zealand company based in Rotorua. They have manufactured and exported fishing rods the world over for decades. Take a look at Kilwell’s range of surfcasting rods. The author Allan Burgess with a sevengill shark taken surfcasting from the beach at Birdlings Flat. Looked at another way when the rod is bent under a load of casting it is acting as a store of energy. This energy being imparted into the sinker to propel it forward. If the rod is not fully loaded because the sinker is too light then it is not storing the maximum amount of energy possible. Yet another way of looking at it is to think of the rod as an archery bow. If the bow-string isn’t fully pulled back you will not get the maximum distance from the arrow when fired. Obviously, at the outer extreme, a very powerful rod requires a strong fit person to obtain maximum tip speed during the cast. Without sufficient muscle strength, you still won’t be able to fully load the rod even if the sinker weight is a perfect match. As with a powerful bow, you won’t get maximum distance from the arrow if you lack the strength to draw the string all the way back. Reels have also become much less expensive in recent years. A fixed spool (eggbeater) is by far the most popular choice for most surfcasters. An eggbeater reel is by far the best option for a complete beginner to cast and fish with. You eggbeater surfcasting reel should be large enough to hold around 300 metres of 11.0kg (25 lb) monofilament. This is about the right line capacity for a surf reel. There are many inexpensive reels of this type available. Surf rod and reel sets can now be bought in New Zealand for as little as NZ$60. For a better quality reel that will last a lot longer and perform better see the complete range of surfcasting reels from Daiwa New Zealand. Any of these Daiwa reels would be a sound and reliable choice for a surfcasting beginner. Shimano Fishing New Zealand also has some tremendous surfcasting reels including the popular top-of-the-range Ultegra 14000 XSC. I personally prefer the Alvey side cast range of surf reels. My favourite being the 650c. These are made in Australia from the finest materials available. Their design is simple and bulletproof. Their main advantage is that there is almost no resistance to the line as it leaves the big spool. This allows lighter rigs to be cast greater distances. They are very popular in their home country, but you don’t see many here in New Zealand. Perhaps the reason is that they are more expensive than the more familiar eggbeaters and so never really caught on. I spoke once to a second-hand dealer in Christchurch who told me that used Alvey reels are very slow sellers even when sold at give-away prices! An Alvey reel will go forever no matter how often you fish with it – or however many big fish you land on it. There are few eggbeaters you could say that about! If you do decide to get an Alvey side cast reel you need to use it with a low-mount rod or it will be awkward to cast effectively. I don’t expect many reading this to seriously consider an Alvey. If you do get one of these Australian reels my suggestion is that you persevere with it. They are surprisingly easy to cast. But they will feel a bit strange, to begin with, if you have only tried an egg-beater style surf reel. This type of reel will be a tough proposition for a novice surfcaster to master. The spool inside the reel spins when you cast making it possible to cast a considerable distance in expert hands. For many years I fished with a Seascape free-spool reel when surfcasting. This thing could cast for miles. This reel was a bit of a strange beast that was also made in Australia. It was manufactured by Wallsend Engineering near Newcastle. It had a very fast retrieve for back in the 1970s of 5.5:1. It was designed to cast and retrieve big lures for tuna from the rocks hence the high gear ratio. It would retrieve over a metre of line with every turn of the handle. Unfortunately, the pinion gear had only ten teeth and eventually split in half. A local tackle store retailer did his best to manufacture another pinion gear for me but it grates horribly when you wind the handle. Free-spool reels will deliver excellent long distance surf casting performance. However, you have to keep a couple of things in mind if you intend using one for surfcasting. You need a large model that will hold plenty of heavy line 20-25 lb. The lighter line can easily be crushed and nicked on a stony beach. You must have a star drag reel which totally disengages the gears placing the reel in free-spool for casting. Suitable models, I have used include Abu 7000 and 10,000, the robust Shimano Speedmaster TSM4, and the Penn Mag Power. These reels are more expensive. They cost as much as six times the price of a reasonable eggbeater. Free-spool reels require a bit of thought before casting if you are to avoid the dreaded “birds nest.” This is caused by the spool revolving and paying out line faster than the sinker is taking it away. It can occur in mid-cast as well as when your sinker splashes down. The answer is to tighten the knobs on your reel’s side plates so that the sinker only drops to the ground in free-spool if you lightly jerk the rod. When you first get to the beach it is best to slightly overtighten the spool, to begin with, make a few casts, then back it off a little at a time. A sinker and baited hooks are more difficult to cast than a salmon ticer because of greater wind resistance. For this reason, it is better to use small baits. Better still employ Breakaway bait shields if possible. Also, try to cast baits and sinkers of a consistent size and weight. For surfcasting, it is also a good idea to leave all the brake blocks in place. When selecting a free-spool reel remember that a big heavy spool is harder to control than a small light one so choose the smallest reel you can get away with. That said a free-spool reel is best avoided by the complete novice. Before moving on from rods and reels I would like to conclude by saying that you don’t need an expensive surfcasting rod and reel set to catch plenty of good fish at the beach. A reliable second-hand fibreglass rod and an adequate eggbeater reel are all you need to get started. In recent years braided fishing lines have all but taken over the market. Unlike monofilament, braid has almost no stretch which means it is far easier to feel a fish biting. Braid is much thinner in diameter than monofilament for a given breaking strain meaning you can pack more line onto a smaller reel. Fine diameter braid also casts further and cuts through wind and water much more easily than monofilament. Nowadays brain is also much less expensive than it used to be. You have to be careful casting braid with an eggbeater style reel because it can easily cut into your finger under the strain of casting. It is a good idea to wear a finger protector when casting with braid. Another good alternative is to use a heavy monofilament shock leader at the end of the braid mainline. A shock leader and lighter line are one way to solve the problem of bust-offs when casting. In this way, you can fish 20 lb mono on the spool with say two-rod lengths of 40 lb shock leader. You can also use a similar length of 50 lb (24 kg) monofilament as a shock leader when fishing braid to avoid finger cuts. Nowadays many surfcasters will spool their eggbeater reel with 50 lb braid only. If you do you should use either a finger pad or one of the small devices available, like the Saltec thumb-caster, to avoid lines cuts. A terminal rig also called a trace by surfcasters, is the hook and sinker arrangement tied to the end of your line and cast out to catch a fish! There are two ways of obtaining terminal rigs; you can either buy them from a tackle store; or tie up your own. The second option will be the least expensive and is quite simple if you take your time. Bought terminal rigs will cost around NZ$10.00 each. There is a huge range of different rigs available in stores. You generally only need a couple of different types. However, for this article Surfcasting Tips for Beginners New Zealand, we are going to keep it simple and get you set up with the just one rig; the Paternoster. This all the most important rig to learn to tie. For many surfcasters, it is the only rig they ever need or use. You will be able to catch anything on this rig from small yellow-eyed mullet all the way up to big 8 foot sharks. It is just a case of using heavier line and larger hooks to target bigger fish. There are two basic ways of tying this rig yourself. Firstly you can use three-way swivels to make a simple-to-tie yet very strong rig for which you need to learn just one knot: the Uni-knot. The second method requires tying a couple of dropper loops into a length of 24 kg monofilament. Tying these loops is a bit tricky for a beginner but if you take your time and have a bit of practice I’m sure you can do it. We are using 24 kg mono because it will take most fish like kahawai, snapper, cod and so on, yet it will be forgiving and less prone to snap under casting pressure. If you try to tie traces from 9kg (20 lb) monofilament and cast them hard with a 150 gm (6 oz) sinker, the whole rig will bust off when you cast. Try to keep the overall length of the Paternoster casting rig, baited hooks and sinker to less than 1.5 meters otherwise, it will be difficult to cast without a tangle. You should take about half a dozen rigs to the beach for each rod being fished in the case of losses. The loss of your terminal rig can be caused by your line getting accidentally wrapped around your rod tip prior to casting. Then when you cast you hear a nasty crack sound like a rifle shot as your line breaks but your rig heads out to sea. Losses also occur from your gear snagging on the bottom or being covered over by sand or shingle moving on the seabed. In the latter case wind in your line after just a few minutes when you first get to the beach and start fishing until you know you are not getting your gear buried by wave action. 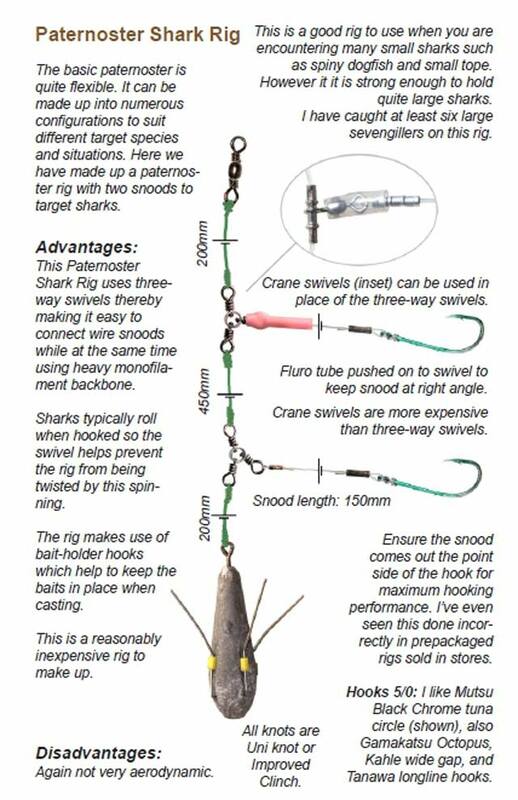 Surfcasting Yoke Rig. Tie up your rigs at home, when you are less stressed, and store them in a plastic ziplock back without the sinker. This saves heaps of time at the beach especially if you have a couple of youngsters fishing with you. Otherwise, you might find yourself tying up rigs the whole time you are at the beach! The two rigs shown above can be found in The Complete Guide to Surfcasting e-book by Alla Burgess. 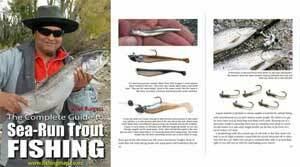 There are seven surfcasting rigs in the book including several designed for distance casting. Again we are going to keep it simple. There are many different types, shapes, and sizes of surfcasting hooks to choose from. I suggest you use a size 3/0 suicide style chemically sharpened hook coloured red or black. These will take kahawai, snapper, moki, cod, and big sharks no problem at all. They are all you need. Perhaps the easiest bait to obtain and deal with is a frozen squid. It is available from tackle stores, service stations, dairies and supermarkets. Squid will take big snapper, kahawai, sharks, and almost anything else. If you are targeting fish that normally eat crabs and shellfish, like elephant fish and rig shark, then you are better to use these types of baits. These two species along with moki will also readily take raw or cooked prawns and shrimp available at supermarkets. The best bait for moki and rig is probably crayfish (lobster tail) and crab. This requires a bit of forward planning such as a trip to the New Brighton Pier or somewhere similar to catch small crabs to use as surfcasting bait later. 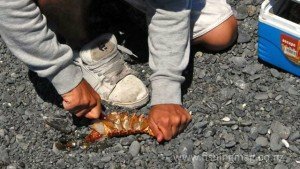 Crayfish (rock lobster) used as bait for moki during Kaikoura Surfcasting Competition. It worked too! Targeting particular species with baits they are more inclined to take is a well-proven fishing method that works. However, I have caught at least a dozen or more elephant fish on frozen squid bait. If you are fishing an area where there are plenty of fish, bait selection is less important than having your line in the water. A good strategy is to take along a variety of baits with you to the beach if you can. Either mix baits on the same hook or bait each hook with a different bait to find out which bait the fish are inclined to take. In my experience dogfish will take just about anything that will fit in their mouths. I like to use yellow-eyed mullet for surfcasting bait. It will out-fish anything for red cod and is readily taken by most species. Yellow-eyed mullet fishing is an enjoyable trip in itself. You can find tuatua on many sandy beaches at low tide. Store them in your freezer and take a few with you when you go surfcasting. The same applies to mussels that can be found on rocks at low tide. Bait catching and gathering are important skills for the surfcaster to learn. Fishing Knots. In any area of New Zealand, there will be a number of popular surfcasting beaches along the coastline. A good place to start looking for surfcasting beaches near you is in the book Spot X Surfcasting New Zealand by Mark Draper. This book lists 400 surfcasting venues all around New Zealand including quite a few that are in isolated out-of-the-way places few people will fish. 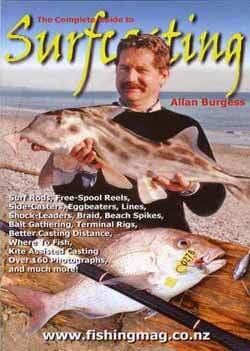 there is also a later edition available which lists 561 surfcasting spots. All of the steeply shelving shingle beaches between Banks Peninsula and Oamaru will produce sharks, red cod, elephantfish and kahawai, and other species. Here is a big sevengill shark caught by Wayne near the mouth of the Rangitata River. 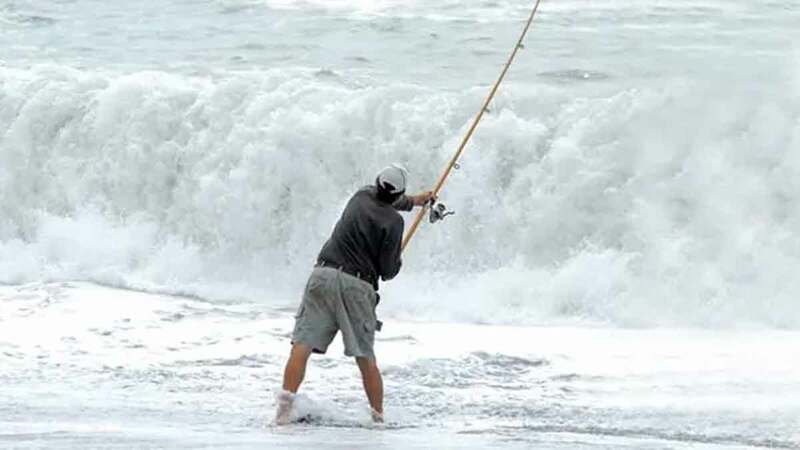 Generally, you will want to plan a surfcasting trip so that you are fishing the incoming tide. It is also preferable to fish a beach when the wind is blowing out to sea. On a steeply shelving shingle beach, you have a bit more leeway to fish the tides and will usually be fishing into deeper water. Even so, you are still best to time your fishing trip to make the best of the incoming tide. Many beginners will be unaware that some of the best surfcasting actually takes place at night. Fish will come right in close to shore under the cover of darkness. Always set up your gear while it is still light. Take a good torch with you and fix a tip light to your surf rod so you can tell if a fish has taken your bait at night. A short video showing how to make your own surfcasting sinker mould from materials readily available in your home workshop. pouring your own sinkers is enjoyable, and saves money. 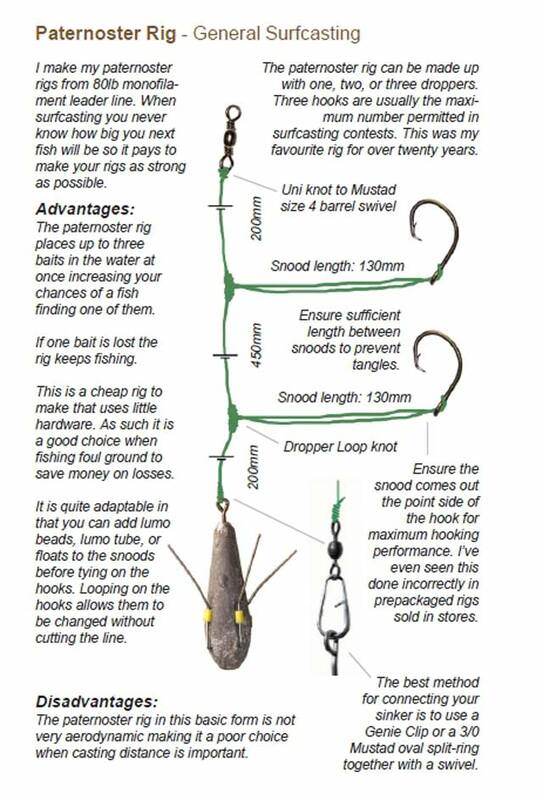 Plus you can make sinkers in shapes and sizes not available in tackle stores. I hope you have enjoyed Surfcasting Tips for Beginners New Zealand. The next thing is to get out on the beaches and start fishing. Like all fishermen, you’ll have good days, and not so good days. Some surfcasting trips will be more productive in terms of fish caught than others. Every trip to the beach is a learning experience. Keep a diary in an old notebook. Each time you go surfcasting record the place, swell, sea-conditions (water clarity), wind direction, bait used, fish caught, and any other important observations. As time goes on you quickly build up a picture of when, and where, is the best time to go fishing. There is nothing quite like the excitement of approaching the beach to discover a big school of kahawai right in the breakers. With your heart pounding you struggle to thread your line up through your rod guides. Surfcasting is great fun for the whole family. Nothing beats a day or an evening spent at the beach fishing. You never quite know which species of fish you might catch next. Nothing quite prepares you for when the times comes, and you are sitting in your folding chair looking out to sea, then suddenly you realise your rod is bent right over in the beach spike! Stay calm. Don’t panic! Don’t forget to send us a picture of your fish when you catch it. Good luck – Allan Burgess.